Goodreads says, "Olive is always unlucky: in her career, in love, in…well, everything. Her identical twin sister Amy, on the other hand, is probably the luckiest person in the world. Her meet-cute with her fiancé is something out of a romantic comedy (gag) and she’s managed to finance her entire wedding by winning a series of Internet contests (double gag). Worst of all, she’s forcing Olive to spend the day with her sworn enemy, Ethan, who just happens to be the best man. Olive braces herself to get through 24 hours of wedding hell before she can return to her comfortable, unlucky life. But when the entire wedding party gets food poisoning from eating bad shellfish, the only people who aren’t affected are Olive and Ethan. And now there’s an all-expenses-paid honeymoon in Hawaii up for grabs. Putting their mutual hatred aside for the sake of a free vacation, Olive and Ethan head for paradise, determined to avoid each other at all costs. But when Olive runs into her future boss, the little white lie she tells him is suddenly at risk to become a whole lot bigger. She and Ethan now have to pretend to be loving newlyweds, and her luck seems worse than ever. But the weird thing is that she doesn’t mind playing pretend. In fact, she feels kind of... lucky." Does this sound like the most perfect beach read or what? Plus, it takes place in Hawaii! I read my first Christina Lauren book last year and LOVED it. I can't wait to dive into this one. What do you guys think? I haven't read any of their books, but I feel like I need to! This one sounds cute! Yes! 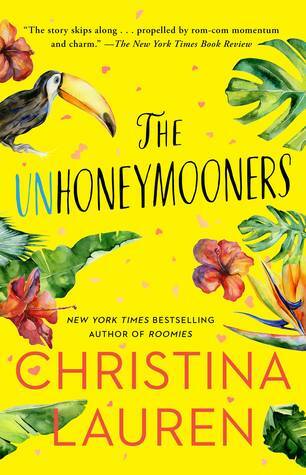 I thought Christina Lauren's novels would be a bit too "romance-y" for me, but I really enjoyed her last novel. Thanks for visiting, Angela! I absolutely loved Love and Other Words. I have their two most recent books on hold at my library now, and I can't wait for them and this new one! Me too! You'll have to let me know what you think of her other books. Thanks for visiting, Michele! I am SO SO SO excited for this book! I snagged an e-arc of it from Netgalley, and I kind of want to read it right now, but I also kind of want to wait to take it on vacation with us in May, because it really does sound like the perfect beach read! Me too! I agree....it seems like the perfect book to savor over vacation! I look forward to your thoughts on it, Christy! Thanks for dropping by.